"I LOVE BEING IN RESCUE. I LOVE BEING A FIREMAN. I do miss the brotherhood back east because I really feel it is different here. Probably the major reason is because they don't have the loss of life out here that we do in New York. A few years ago, Phoenix lost a firefighter whose name was Bret Tarver in a commercial fire. His company would understand what the brotherho0d is because when you loose firemen in your company, you get closer. I really feel that especially when you are talking about back east. Just from the amount of lives lost there you can't help from getting closer. That is the whole Department. It is just so close. It's a real brotherhood because of the loss of life. It brought NY together and brought people to the firehouses. The brotherhood was there then when all this happened, it sort of made everyone in New York part of that brotherhood. It even made everyone throughout the whole country part of that brotherhood because everyone was part of New York that day and part of the Pentagon!" 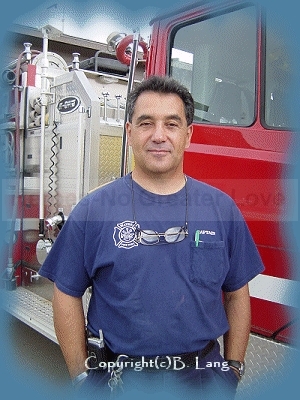 Captain Tufano works for the Mayer Fire Department up north in Arizona. He made his way against all odds back to NY to help his friends in the FDNY. In 1996, Joe retired from Rescue 4, Queens and knew many of those who were lost. He worked tirelessly to retrieve those he could to send them "back home" even though it was a hard time not only physically but especially emotionally. At moments, like all those at GZ, he put his life on the line as he does every day as a firefighter, but these were special and unusual circumstances. We are grateful to him and all those who came to help us in NY. Thank you Joe.